Sony Xperia Z3+ (known as Sony Xperia Z4 in Japan) is an Android smartphone produced by Sony. Unveiled on April 20, 2015, it is an evolved version of 2014's Xperia Z3 with upgraded specifications, a thinner body and Android 5.0 "Lollipop". The phone was awarded for the best European Multimedia Smartphone for the year 2015-2016 by European Imaging and Sound Association. "Inspiring you to make everyday extraordinary"
The device was first unveiled on April 20, 2015 exclusively for release in Japan as the Xperia Z4. 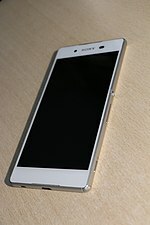 On May 26, 2015, Sony announced an international release for the device scheduled for June; for the international release, the device was re-marketed as the Xperia Z3+. On June 16, 2015, Sony announced the Xperia Z4v (E6508), a variant of the Xperia Z3+/Z4 exclusively for Verizon Wireless in the United States. However, on October 5, 2015, Sony and Verizon announced the device had been cancelled, citing stiff competition from other flagships, as well as poor launch timing with the release of its successor, the Xperia Z5. The Xperia Z4 first went on sale in Japan on June 10, 2015, and the Xperia Z3+ first went on sale in Hong Kong on June 12, 2015. The Xperia Z3+/Z4 is nearly identical in design to its predecessor, with a metal frame and glass rear, aside from minor differences such as a slimmer and lighter build. The Qualcomm Snapdragon 801 of the Z3 has been replaced by a Snapdragon 810, with support for LTE Cat 6. The Xperia Z3+/Z4 features a 5.2 inches (13 cm) FHD 1080p display with a density of 424 ppi, featuring Sony's "Triluminos" technology, as well as 32GB of internal storage and a non-removable 2930 mAh battery with support for Qualcomm's Quick Charge 2.0 standard. The Xperia Z4 has several features not found in the Xperia Z3+, such as a 1seg DTV antenna allowing for reception of television channels broadcasting using the ISDB-T standard, as well as an Osaifu-Keitai mobile payment system using Sony FeliCa ICs. The now-cancelled Xperia Z4v for Verizon was thicker and heavier the Xperia Z3+/Z4 due to the inclusion of Qi/PMA wireless charging. The Xperia Z4v also would have featured a WQHD 1440p touchscreen display as well as the inclusion of Verizon logos on the front and back of the phone. The Xperia Z3+/Z4 features an "Omni-Balance" design, somewhat modified from the Xperia Z3 and more reminiscent of that of the Xperia Z2. The Xperia Z3+/Z4 features an exposed micro USB port at the bottom, the first in the Xperia Z series and the second Sony phone overall after the Xperia M4 Aqua to have such a feature. Although the micro USB port is exposed, this does not impact the phone's IP65/68 dust protection, water jet protection and waterproof rating. The Xperia Z3+/Z4 is available in four colors: black, white, copper and aqua green (Ice Green in the UK). ^ "Xperia Z3+ plus wins the best European Multimedia Smartphone". Xperia Blog. 16 August 2015. ^ "European Multimedia Smartphone 2015-2016 winner". European Imaging and Sound Association. 16 August 2015. Archived from the original on 14 April 2016. ^ "Sony announces the Xperia Z4 flagship smartphone in Japan". The Verge. Retrieved 26 May 2015. ^ "Sony's flagship Xperia Z4 goes global with the humbler title of Z3+". The Verge. Retrieved 26 May 2015. ^ "Xperia Z4 released in Japan today; receives day-one update for speaker issues". Xperia Blog. June 10, 2015. Retrieved June 12, 2015. ^ "Xperia Z3 Plus now on sale in Hong Kong, launches in Taiwan on Monday". Xperia Blog. June 12, 2015. Retrieved June 13, 2015. ^ "See the Sony Xperia Z4 next to the Z3 - can you tell the difference?". Techradar. Retrieved 27 May 2015. ^ "Sony Xperia Z3+ review: Hands-on with renamed Xperia Z4 adding minor upgrades". PC Advisor UK. May 26, 2015. Retrieved June 6, 2015. ^ "Sony Xperia™ Z3+ dual (E6533) White Paper" (PDF). Sony. Retrieved June 6, 2015. ^ "Sony Xperia™ Z3+ (E6553) White Paper" (PDF). Sony. Retrieved June 6, 2015. ^ "Sony Xperia Z4 TD-LTE 402SO Specs". PDAdb. Retrieved June 6, 2015. ^ "Sony Xperia Z4 LTE-A SO-03G Specs". PDAdb. Retrieved June 6, 2015. ^ "Sony Xperia Z4 WiMAX 2+ SOV31 Specs". PDAdb. Retrieved June 6, 2015. ^ "Sony Xperia™ Z4v (E6508) White Paper" (PDF). Sony. Retrieved June 20, 2015.